When a Peace Corps volunteer returns from spending two years working overseas with counterparts struggling to earn a sustainable living, it’s not uncommon for the RPCV to end up involved in Fair Trade. Mary Joan Ferrara set off for Botswana in 1989 to run a weaving workshop for people with disabilities. 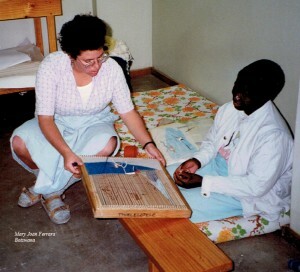 She has worked with the Guatemalan artisans of UPAVIM, one of the founding member organizations of the FTF, since 1998.